By any account, it was going to be a busy week at the bookstore — even by Ohio State standards. With the campus humming with the activity of a new semester, it was a week where Barnes & Noble at The Ohio State University Bookstore Manager Kathy Smith was anticipating the launch of the new Ohio State Nike sneaker (a very big event on campus), while also hosting Ohio State alumni and Heisman Trophy winner Eddie George for an exclusive Direct TV promotion. And, if that weren’t enough, the bookstore welcomed the National Retail Federation to campus as part of an extensive state-by-state road trip to find the most powerful retail stories across the nation. The National Retail Federation (NRF) developed the Retail Across America program as a way of showing how retailers from around the country, large and small, are creating jobs, driving innovation and giving back to the communities they serve. The reasoning behind their program isn’t hard to understand given the massive impact retail has on economies and communities. Responsible for 42 million American jobs nationwide, the retail sector supports a quarter of the jobs in the state of Ohio alone, while contributing 18 percent of the state’s GDP. 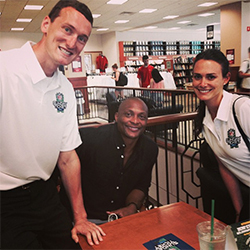 Heisman Trophy winner and Ohio State alumnus Eddie George makes an appearance at the Barnes & Noble at The Ohio State University bookstore. As part of the Retail Across America program, the NRF dispatched Dylan Lynch, a student at the Fashion Institute of Technology, on an assignment to obtain a behind-the-scenes view of a variety of retailers in the Buckeye State, including Macys, Jo-Ann Fabric and Craft Stores, Wendy’s, and the nation’s largest full-service grocer, Kroger. Lynch’s reporting also took him to The Ohio State University (OSU) South Campus, to the 50,000 square-foot premier academic superstore and a staff willing to share their retail experiences at their busiest time of the year. 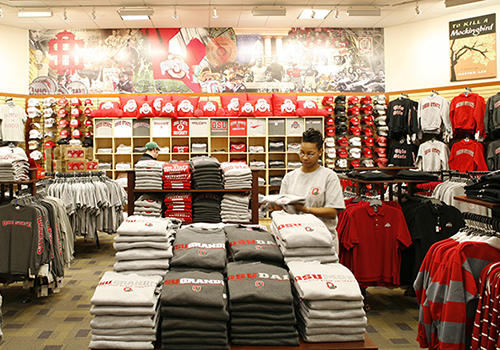 An integral partner of the University since 2000, Barnes & Noble College also manages a stadium store, a store in the student union, and outlets at three other Ohio State campuses. 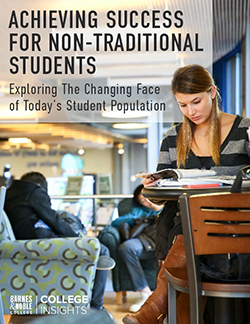 “As the students’ bookstore, we try to be fully integrated into all aspects of our students’ experiences at Ohio State — not just as their textbook provider or game-day school spirit supplier,” explains Smith. Part of that mission includes constant engagement with the campus community, whether it’s supporting the English Department’s Annual 5K Fun Run, holding student events in the bookstore’s meeting area, or helping freshmen acclimate to their new home through orientation and a VIP Shopping Night. “The story we sought out at the Ohio State bookstore is one that millions of Americans can relate to, but might not see through the lens of the retail industry,” explains Margaret Case Little, Senior Director, Strategic Initiatives at NRF. 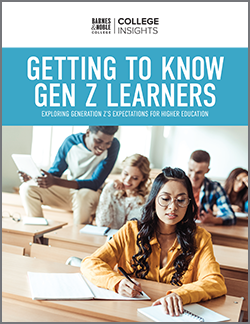 “Gearing up for the first day of college, ensuring you have the right textbooks and branded t-shirts — it all makes a difference when you’re adjusting to college life,” she adds. 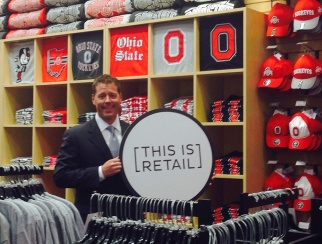 As NRF’s partner for Retail Across America/Ohio, Ohio Council of Retail Merchants President Gordon Gough, pictured in the OSU bookstore, joined the road trip, including a stop at his alma mater, The Ohio State University. And if that’s the criteria for success, it would seem that Smith and her staff at the Ohio State bookstore are succeeding on every level.